A lot of water had flowed under the old bridge since I'd last been enthused about the prospect of the waterfowl season opener in my home state of Wisconsin. In fact, it had been a long time&apos;¦10 or 11 years&apos;¦since I'd even been home to experience one. Those special, annual trips to the Canadian prairies with good friends, coincidentally, but unintentionally planned through the late September/early October calendar, always took precedence. But while I looked forward to the '07 opener with guarded optimism (for reasons I'll explain later), it was the memory of my last, long-past Badger state opening day that came flooding back. Flush not rush — Billy's rules. Just as it was last year, a gap in my travel schedule found me weighing my options as the Wisconsin duck season approached. But none of them were proving viable. Duck "shooting" with the crowd at one of the local public waterfowl venues was&apos;¦well&apos;¦out of the question. Since it had been another drought-filled summer and early fall, there were no flooded-out private land honey-holes to be found. The sometimes wet-spotted cornfields were all dry and concrete hard. With the creeks and rivers well within their banks, there were no seasonally-wet, ducky edges to be exploited. And though I'd checked them all&apos;¦.I thought&apos;¦.every out-of-the-way pothole or puddle I'd ever hunted in the 40-somethin' years of my fowling life in Eastern Wisconsin was not only duckless, but barely muddy. Having hit the wall, I'd pretty much conceded defeat. Still, as I settled in to watch Bucky's football team that glorious, early October Saturday afternoon, it was with thoughts of whistling wings and webbed feet weighing heavily on my mind. Then, during the halftime stretch, it hit me. "What about the open water spring hole in the state owned cattail swamp barely a half-mile from my home?" Totally unapproachable in wet years, it would still be a tough, maybe impossible slog. But it would be worth the effort, if not for a bird or two, then at least for the self-satisfying participation award that would be knowing we tried. Seeing that Sadie, my then aging yellow dog&apos;¦who obviously sensed, as gun dogs do, that "the time" was at hand&apos;¦was as restless as I, it was off to the races. We found the going every bit as nasty as I expected. Bulldozing through the boot-sucking mud in the outer rim of the still green marsh was tough enough. But when we got to the water, the sticky footing gave way to bottomless muck. Operating happily in four wheel drive, Sadie motored along just fine while I clumsily stumbled from one hummock to another. Sweatin' like the old race horse I never was, I was just about to turn back when the place erupted, as a hundred or so woodies, along with a handful of teal, took wing. There was no way I was ready to shoot at the flush. But I was when they made that only hoped-for return rush a couple minutes later. Mired deep in the weeds, the summer ducks were totally oblivious to me as they rocketed downwind and overhead, then banked in a hard, descending turn, to float back, flaps down, toward the hole, that though walled off by a thick stand of tulies, I guessed to spread no more than 10 yards in front of me. Fully illuminated in the late afternoon sunshine, I folded a gaudy drake that caught my eye, then got lucky, dropping a second, but backlit bird, as it flared, climbing out into the sun. I don't know how, given her muddied, low-lying perspective, but Sadie must have seen the first bird fall. Plowing her way through the thickly-matted tails; she returned bearing our first prize in short order. Blinds were never her forte', but she always trusted me. So when I gave her a line on the second duck she was off again, this time on little more than a hope and a prayer. But it was one the red gods answered. After a lot of splashin' and thrashin', there the old girl came, huffin' and puffin', another dandy drake, fortunately, clenched proudly in her jaws. It was one of her/our finest moments. Billy and Sadie in wait. We had our limit of woodies. That was great. And it was enough. We were outa' there, memories in heart and hand, knowing, that by our standards, we'd won. Now, determining just what it is that constitutes an opening day win is certainly personal business. Business complicated by the fact that in these days of special early goose seasons, seasons on migrant geese that open a week or more ahead of duck season, the pre-season youth hunt, duck seasons opening on different dates in different zones, (ie northern and southern), and split seasons, with intra-season closures, the strong opening day tradition that was such a special part of our grand sport back in the day, has been, sadly, all but lost. Time was when Opening Day really meant something! After a sleepless night in its anticipation, it meant staking out your spot in the local public marsh or along a popular lakeshore; and defending it against intruders until the opening gun sounded. Then, as all hell broke loose, you partook of the bounty that numbers of staged, but to that point in the year, totally unhunted, unpresssured, uneducated birds provided, right along with everyone else. That one day&apos;¦Opening Day&apos;¦was a party, a celebration of the season to come. And it was one that could be expected to provide some real decent gunning. Having waited all year for The Opener, there wasn't a chance in hell we'd miss it. Ah, but not anymore. Fact is, with all the pre-season pressure inadvertently applied on them by the earlier opening goose and youth seasons, public area ducks just aren't there like they should be, like they could be. That said, the gunners, (though not the hunters), still are. For most of those out and about on public areas during Opening Day, the success of their entire duck season will be gauged by how much shooting they get on that one outing. And though they shoot as much as possible, while hunting poorly, the god-awful pressure these unchecked numbers of sports apply only further disperses the birds, to the detriment of the real hunters targeting public ground for the rest of the season. Since we've pretty much eliminated the regular public areas then, just what is a duck hunter to do to salvage his Opening Day? What can be done to engender "The Tradition"? dred spirit, a special relative or friend. Avoiding competition with other hunters is imperative. But we'll still want the opportunity to work a few birds. That is why we're out there after all. Still, the quantity of the birds available will always take a backseat to the overall quality of the hunt. Knowing what we want then, all we have to do is go out and find it. Easier said than done of course, the process of finding that special Opening Day hunt requires no small amount of time, determination and due diligence. Since it's a process involving top maps, aerial photos, burning boot leather, and putting in windshield time that's been well documented in these pages before, we'll not belabor the point here. It's enough said that you no doubt know what we mean. Finally, there is another, if more exotic option. And that's to buy or lease property with existing wetlands, or wetland restoration potential. Now, this might seem extreme. 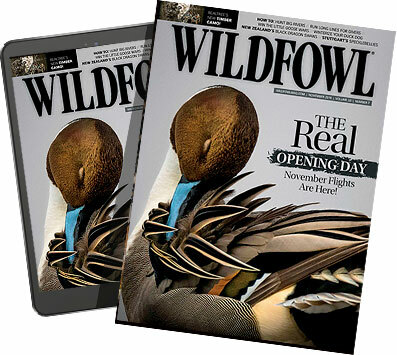 But given their demographic profile, it's something well within reach of the average Wildfowl subscriber. One who'd not only find such a project self-satisfying, but a sound investment in the economic sense as well. My son, Bill, who works for the Wisconsin DNR at the Mead Wildlife Area, has gone this route. Taking the plunge, he's made a leveraged, long term investment in a chunk of marginal farmland in the central part of the state. By utilizing available state and federal programs, he's begun the process of restoring grassland and wetland habitat on the acreage, the first major step of which was a scrape and dike building project that resulted in a nearly five acre, irregularly shaped, shallow water wildlife pond in '07. Watching it slowly fill throughout the dry summer was tedious. But early September rains topped it off nicely. A few early migrating teal discovered the waterhole right off. But when the northern zone duck season opened on the Mead, with it's usual, intense hunting pressure; a swarm of its displaced mallards found the new, secluded hole on Bill's ground&apos;¦only ten miles distant as the duck flies, but in the then as yet unopened southern zone&apos;¦to their liking. It seemed to be a classic, though almost too-good-to-be true case of "Build it and they shall come". Bill was thrilled, but a little hesitant I sensed, to tell me about the situation. At only 32, and having traveled extensively with the Old Man, he's too young to have been grounded in the grand, old, Opening Day tradition. And too spoiled, honestly, having seen so much quality hunting on the prairies over the years, to get all wound up about the possibility of what could just be a one day shoot. Plus, being the biologist/wildlife manager type, he was satisfied just knowing his efforts had borne fruit, that the ducks were there. But I wasn't! There was a good opening day hunt in the offing. And we were going to take advantage of it. Though not without some ground rules I'd come to learn. A pair of "bonus" Canadas. In a case of role reversal Bill lectured me, "First item of business is to sneak up the dike and photograph the birds as they flush. Then we'll set up and hunt drakes only! We'll take 'em as singles, pairs or in small flocks, but there'll be no shooting at the big wads. And no matter what, we'll pull the plug by mid-afternoon to let the birds get back in there." "Yes Boss," I replied thinking, "The lad's learned his lessons well." And that's pretty much how Wisconsin's '07 opener went for us. Bill, his Lab, Maggie, along with myself and Tanner, Maggie's older brother, laid out in the scant cover on the pond's edge in our ultra-low profile layout blinds. Fronted by a small rig of floaters, both ducks and geese, and with a set of goose silhouettes and full-body field mallards scattered along the shore, we went to work. It was a gorgeous autumn day. But the sunny, bluebird weather, in combination with birds that had been badly burned the weekend before, made for a tougher-than-expected hunt. Oh, the ducks wanted our/their water alright, but they were already late season cautious. Returning in flocks of 50 or more, the mallards would close to 70 yards or so before making us. It was a wonderful show. When a positive I.D. was made, that boy duck was in serious trouble. Though a few ducks shy of the limit, but with a pair of bonus honkers to pick up the slack, we ended our hunt according to plan. Now, maybe our stars just aligned. While we'll no doubt be lucky to duplicate last year's experience consistently in seasons to come; it'll be worth the effort to try. Because, more than just a handful of birds and a heart full of fond memories, we (Bill and I) came away from the Opening Day past with the soul-satisfying knowledge that "The Tradition" is alive and well.